By any name, the world's largest aviation celebration held in late summer on the shores of Lake Winnebago in Wisconsin is the absolute definition of perfection for any Airplanista. It's everything we could possibly dream of, and then a LOT more. 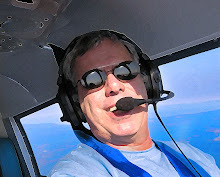 Yes, of course I am talking about EAA AirVenture Oshkosh, the "official" name of EAA's annual convention. But in conversation, very few people use that entire title, with many calling it "AirVenture" while the old schoolers demand it be called "Oshkosh." Truth is, both are correct...that is, when you know the difference between the two names. While the following is my own interpretation of this topic and is in no way endorsed by EAA, I think these definitions will go a long way towards clearing up the way people exchange "AirVenture" for "Oshkosh" and vice-versa. When you are referring to the EAA annual convention, the trade show, the forums, presentations or workshops, Kidventure or the Innovations Center, it is correct to call it "AirVenture" because AirVenture is the event that is located in Oshkosh. So, a correct use would be "We make the XYZ 3000 Light Sport airplane, and I am going to debut the new ship in Oshkosh at Airventure." 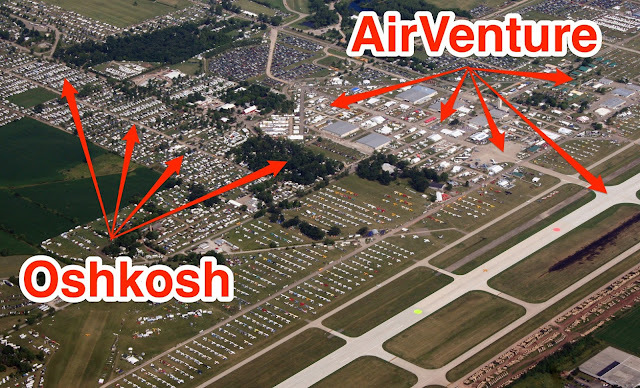 Of course, in the aviation world, anyone will know you are referring to Oshkosh when you say AirVenture. While the non-flying will reply "oh, the place where they make those cute little overalls," when you tell them you are going to spend a week in Oshkosh, pilots and the aviation family have an entirely different meaning for the word. "Oshkosh" is a city in Wisconsin, yes, but it is a state-of-mind for aviators, a happening, the Woodstock of the aviation world. Some even go so far as saying "Oshkosh" during show week is hallowed ground, and having been there numerous times - each better than the one before it - I find it hard to dispute that claim. "Oshkosh" is the word to use when talking about the aviation family reunion that surrounds AirVenture. It is the celebration, the parties, the family quality time, the Beer Bashes and Oshbashes, all the things that makes this show so great. People attend AirVenture, the trade show and convention to enjoy Oshkosh, the airshow. The explosion of camaraderie that happens with 500,000 #avgeeks end up in one place at one time happens at Oshkosh. I personally look forward to my next Oshkosh usually when I leave the grounds each year. That's because there simply is nothing that even comes close for pilots and wannabes to gather, tell stories, eat Brats, drink a few Leinie's and do the kind of spectacular hangar flying that can only happen as a B-29 and two B-17s slide by overhead at 4,000AGL, escorted by 16 P-51s. So there you have it, my interpretation of the way different people use different names for the same event. You are hereby clear to call AirVenture "Oshkosh", or call Oshkosh "AirVenture," it really does not matter. What matters is that you make plans today to attend this incredible event. Airventure.org is a great place to start your planning.